Pecan Toffee Crunch is a low carb /keto treat that will blow your ever-loving mind! 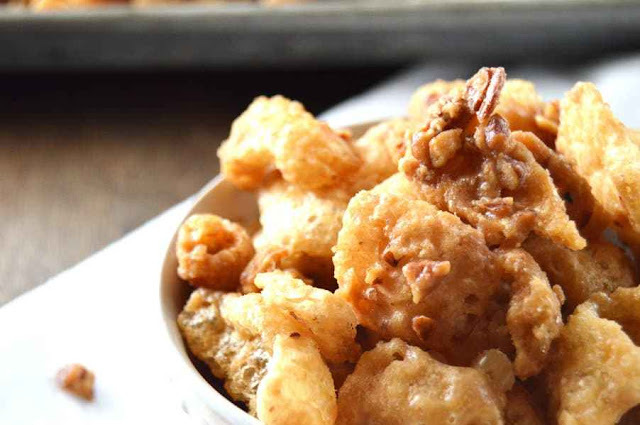 Sweet, buttery, caramelly, sugar free toffee, paired with the richness of the pecans and the perfect crunch of the pork rind is so good you won’t believe your biting into a pork rind…I promise. They stay perfectly crunchy for days, so they are great to pack up in smaller servings to put in a lunchbox or for traveling. Line a sheet pan with parchment and set aside. Place pork rind pieces in a medium bowl and aside. In a small saucepan, combine sweetener and butter and melt over medium heat. Bring to boil stirring constantly. Turn heat down to medium low and continue to boil for about 5 minutes. Add the pecans to the butter mixture and continue to cook for another 1-2 minutes or until you can smell the toasty pecans. Remove the butter mixture from the heat and stir in vanilla and salt. Pour or spoon half of the butter mixture over the pork rinds and toss to coat. Repeat with the remaining butter mixture. Pour the pork rinds onto the prepared pan and let cool, you can also place them in the fridge to harden. Store at room temperature in a sealed container and enjoy! 0 Response to "KETO / LOW CARB PECAN TOFFEE CRUNCH"